Great events bring speakers, content, and attendees together. Drive higher attendance by starting with our event marketing promotion template. You’ve worked hard to plan an amazing event, but if few people attend, it won’t make the impact you want. Truly successful events attract an ideal audience with tailored promotions in the right place at the right time. Without a way to coordinate outreach and promotions, channels can overlap, deadlines slip, and potential attendees disengage. 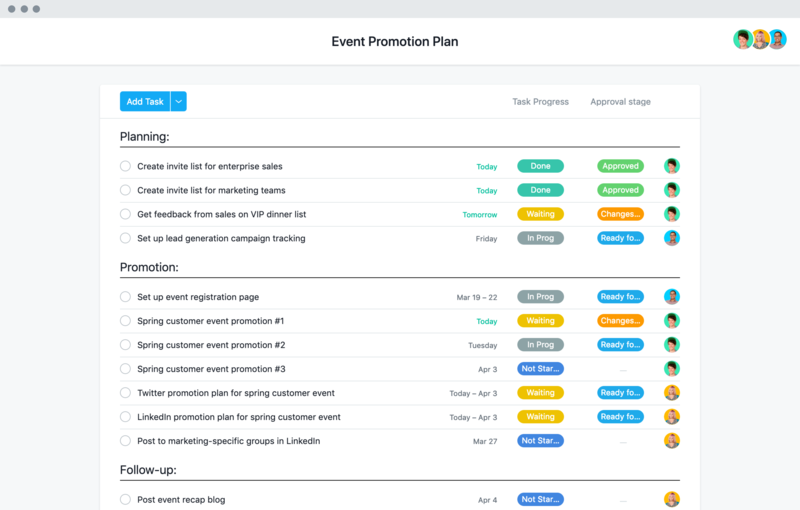 By starting with our event marketing promotion template, teams can plan and manage promotions in one place alongside their overall event plan to drive attendance goals. Visualize your promotion schedule on a timeline. Map out a promotion plan before you start working (and easily shift the schedule if something comes up.) Looking at work on a timeline helps you ensure promotions go out at the right time. Provide clear and actionable feedback. You can provide feedback directly on any image file so designers can see feedback in context and make sure it gets implemented before event promotion materials go out in emails, web pages, or social posts. Make approvals clear. Instead of pinging teammates or accidentally using the wrong asset, you can manage approvals directly in Asana so it’s clear when work is final and approved. Test promotional emails before sending them. Forget context switching. Asana integrates with Litmus to keep your email creation process smoothly, from designing to sending. Bring your brand to life and engage customers with these five tips. Events can be stressful, but our short tutorial can bring you peace of mind. Learn the best event productivity hacks with tips from experts at Asana and Eventbrite. Register for our event planning course to learn the best way to manage your event in Asana. Templates are the first step. But with all Asana Premium features, you can deliver your best events yet.